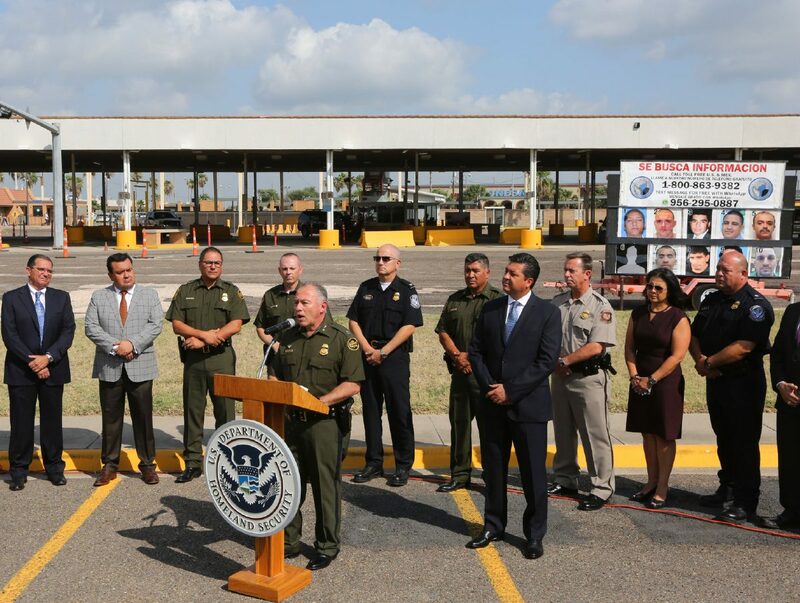 U.S. Border Patrol Sector Chief for the Rio Grande Valley Manuel Padilla Jr., center, talks about a security campaign in which U.S. and Mexico officials will share information as he stands with Mexican Tamaulipas Gov. Francisco García Cabeza de Vaca during a news conference Thursday, June 7, 2018, at the Hidalgo-Reynosa International in Hidalgo. 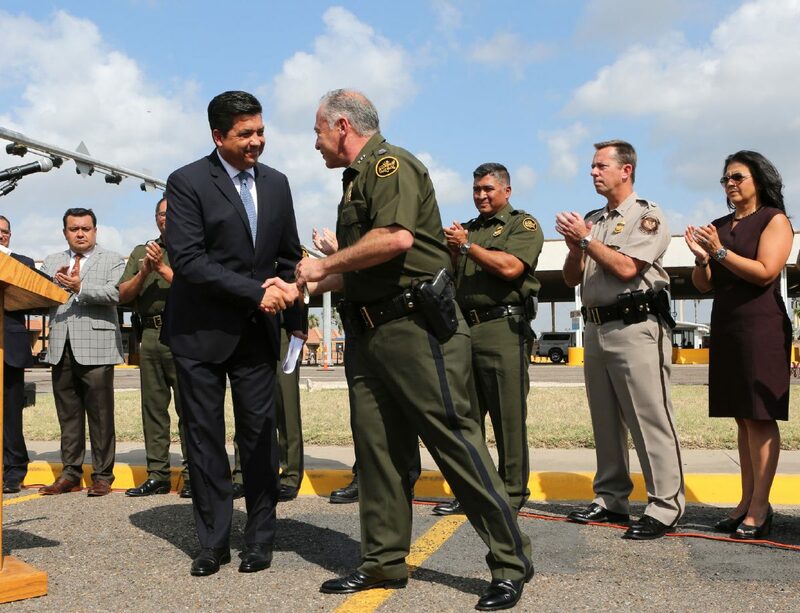 HIDALGO — Border Patrol leadership and the governor of Tamaulipas stood feet from the U.S.-Mexico border here Thursday to announce the launch of what the Rio Grande Valley’s sector chief called a “non-conventional approach” to border and community security. Dubbed “Seguridad y Prosperidad,” or “Security and Prosperity,” the campaign focuses on increasing information sharing between residents and government officials on both sides of the border. “We do a great job during emergencies,” said Manuel Padilla Jr., chief patrol agent for the Rio Grande Valley sector. “When we have a very bad situation in Mexico or on the U.S. side, we come together very, very well. When it comes to involving the community in a bi-national manner looking at this area as one area of operations for the criminal organizations, we were not doing that well. “Every time we have divisions between law enforcement and our partners in Mexico, this creates a safe haven for criminals to operate,” Padilla added, highlighting high rates of extortion, money laundering, kidnapping and drug and migrant smuggling in the border region. U.S. Border Patrol Sector Chief for the Rio Grande Valley Manuel Padilla Jr., center, shakes hands with Mexican Tamaulipas Gov. Francisco García Cabeza de Vaca during a news conference Thursday, June 7, 2018, at the Hidalgo-Reynosa International in Hidalgo. Padilla announced a new security campaign in which U.S. and Mexico officials will share information on criminals working on both sides of the border. Mexican Tamaulipas Gov. 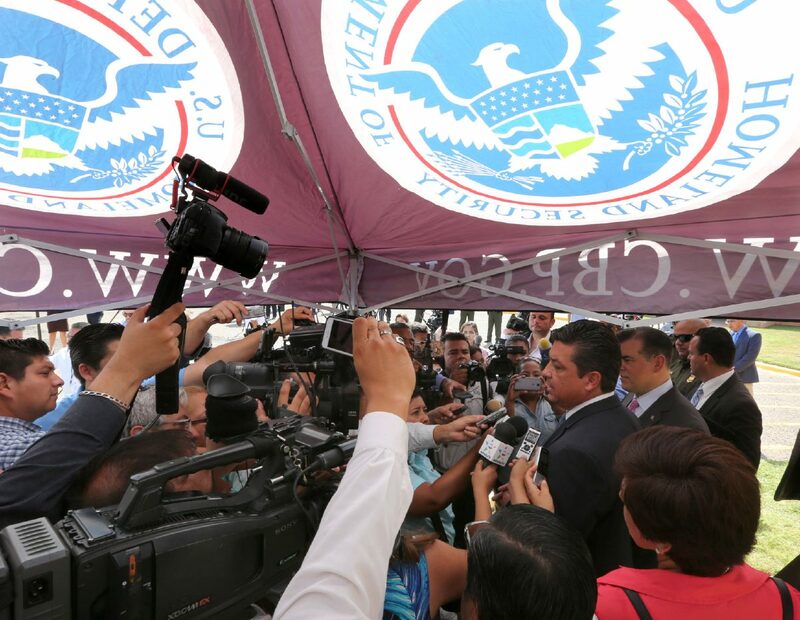 Francisco García Cabeza de Vaca, right, stands under a U.S. Department of Homeland tent as he answers questions during a news conference Thursday, June 7, 2018, at the Hidalgo-Reynosa International in Hidalgo. Cabeza de Vaca announced a new security campaign in which U.S. and Mexico officials will share information on criminals working on both sides of the border. 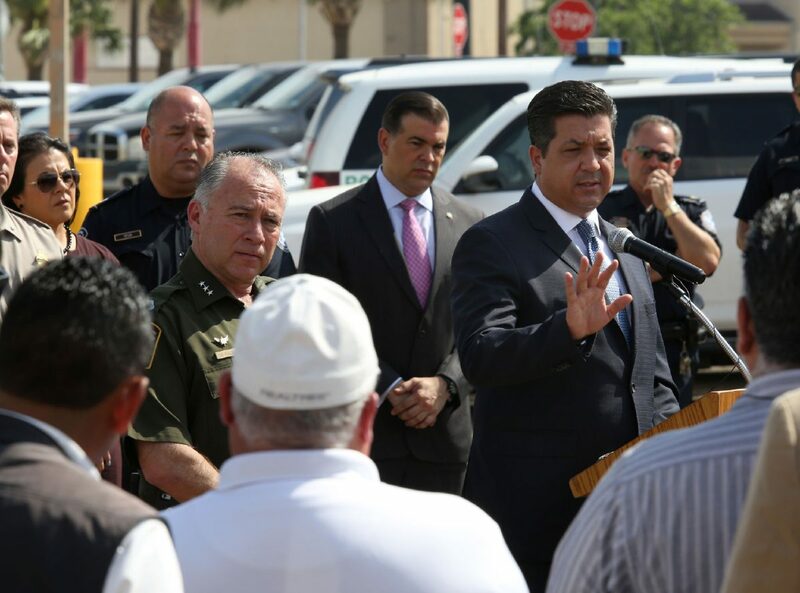 Governor of Tamaulipas Francisco García Cabeza de Vaca, right, answers questions with U.S. Border Patrol Sector Chief for the Rio Grande Valley Manuel Padilla Jr., left, during a news conference Thursday, June 7, 2018, at the Hidalgo-Reynosa International Bridge in Hidalgo. A relative of Cabeza de Vaca was arrested Monday morning in San Antonio on a bulk-cash smuggling charge. U.S. Border Patrol Sector Chief for the Rio Grande Valley Manuel Padilla Jr., center, talks about a security campaign in which U.S. and Mexico officials will share information as he stands with Mexican Governor of Tamaulipas Gov. Francisco García Cabeza de Vaca, right, during a news conference Thursday, June 7, 2018, at the Hidalgo-Reynosa International in Hidalgo. 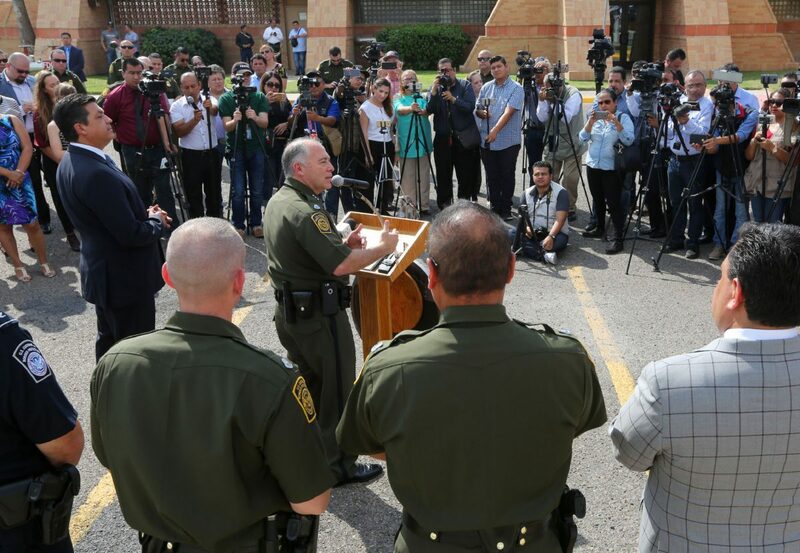 At its core, the campaign encourages residents of the Valley and Tamaulipas to share tips, particularly about the whereabouts of individuals suspected to be involved in transnational criminal activity, via a telephone hotline monitored around the clock by Border Patrol agents, who will share leads with a bi-national team of law enforcement agents. The tip line, which consists of a toll free number and a Whatsapp number, is completely anonymous. In terms of increasing public trust in the government, particularly in Mexico, Padilla said bi-national actions as a result of tips, such as arrests of members of criminal organizations, would be sufficient to restore public confidence in state authorities.